Registration is now open for the competition, which sees 16- to 18-year-olds take part in a series of debates in what has been dubbed ‘the UK’s toughest debating competition’. Local schools will enter teams of between four and six sixth-form students, and Debating Matters particularly welcomes applications from schools without a history of traditional debating. Uniquely for this special event, a public debate as part of the Oxford Festival of the Arts will follow the final of the competition. Important political figures will discuss ‘From sexting to screen-addicts: should we be afraid of online harms?’. The event will be chaired by Claire Fox, the director of the Academy of Ideas, and guest speakers include Dr Victoria Nash, deputy director of Oxford Internet Institute, Martyn Perks, a digital business consultant and writer, and Jessica Butcher MBE, co-founder of Tick/Blippar and a TedX speaker., and Alex Krasodomski-Jones, director, Centre for the Analysis of Social Media, Demos. All schools taking part are invited to attend the debate and tickets are also available for members of the public, as part of the festival, for entry to the schools’ debate final and the public event. As ever with Debating Matters, it will be the substance of the arguments – rather than the style of presentation – that will decide the winners, and participants are encouraged to leave no stone unturned in a day of fierce, frantic and, most importantly, free debate. The students will face judging panels of adults from a wide range of professional backgrounds - including local business leaders, scientists, authors and academics - who will quiz them on their arguments and challenge them to defend their research and thinking. 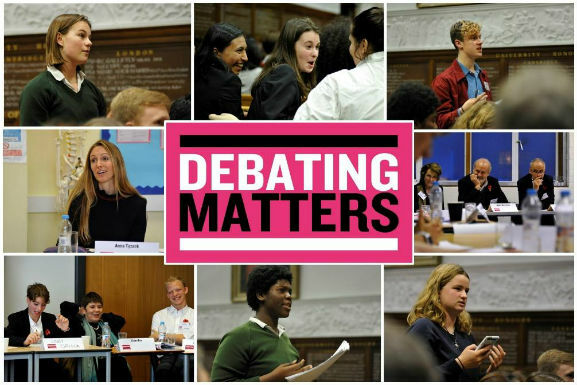 To book a place for your school at Debating Matters Oxfordshire, please email Bernie Whelan on bernie@theboi.co.uk or call on 020 7269 9230. Please note, there are VERY LIMITED SPACES. Get in touch ASAP to take part.